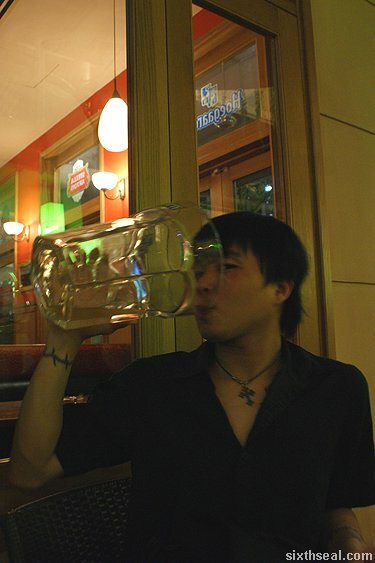 …can a person drink (scull) 5 liters of beer? I’ve always been a big fan of single (and available) malt whiskeys. I guess it appeals to the more refined side of me (yes, you have to squint, but it’s there :p). 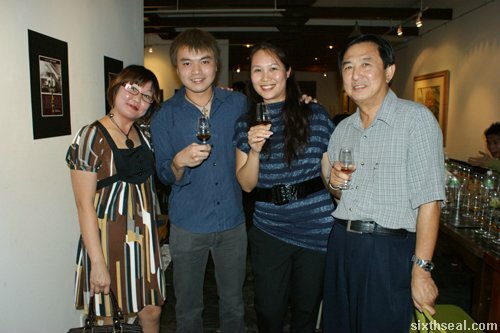 I’ve had Glenfiddich Solera Reserve before and I loved it. 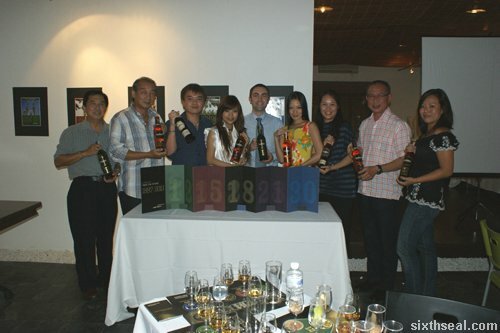 Thus, I jumped at the chance when Kim invited me to a Glenfiddich whiskey tasting session. 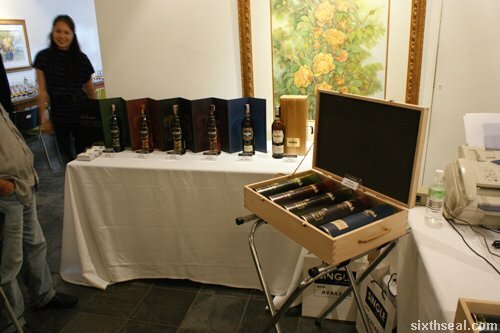 It’s tantalizingly called Glenfiddich – Taste The Future and I was told that we’ll be sampling several Glenfiddich products, including some that are not available in the market (!). How could I refuse and still sleep at night? The ethanol connoisseur in me (no, you don’t have to squint to see this part) arrived promptly at 3 pm to meet up with Mr. Ong (Kim’s dad). 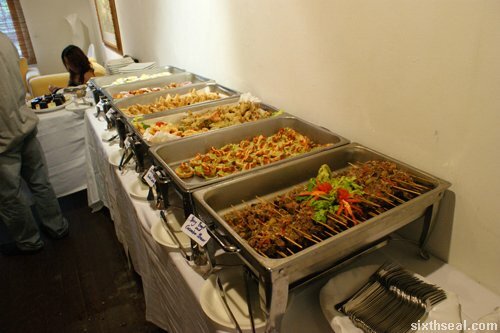 There was a righteous spread of food before the whiskey tasting started. 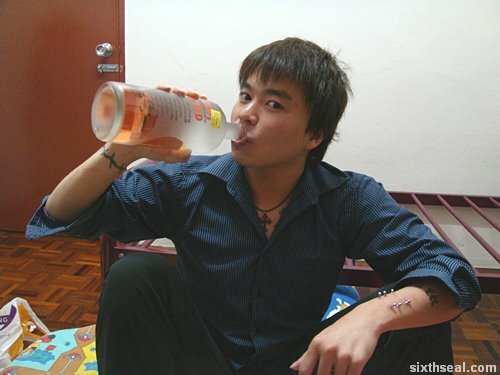 I’m not one to eat before drinking since I like drinking on an empty stomach. Just to torture my body, ya know. ;) However, I grabbed a plate and nibbled on some food just to be polite. Heh! 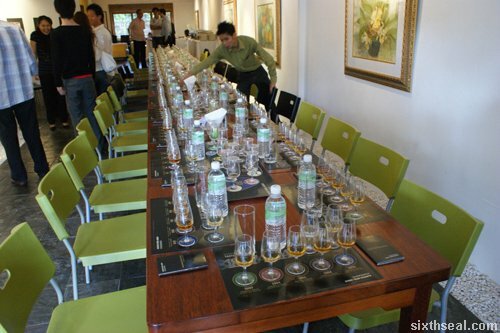 …and two mystery glasses labeled “New Make Spirit” and “Future Glenfiddich“. Intriguing. I like! 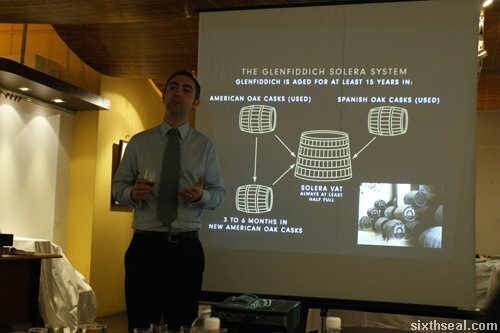 Mr Ludoviq Ducrocq taught us the proper way to taste single malt. You swirl the liquid around and smell it before sipping it. 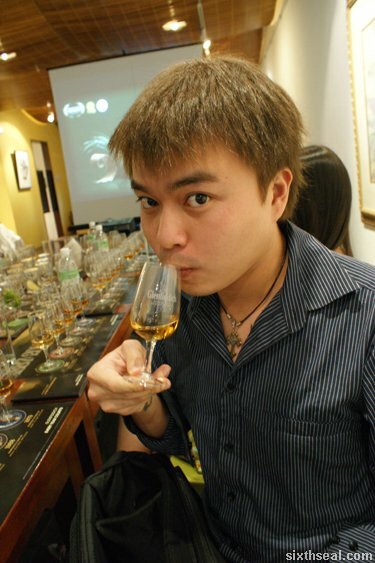 The whisky is rolled around your tongue while you breathe in to capture the notes of the whisky before swallowing. 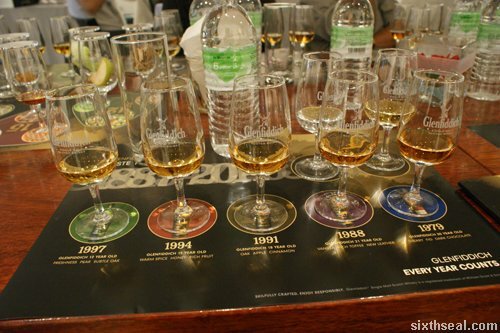 We started off with the Glenfiddich 12 year old and progressed throughout the years. 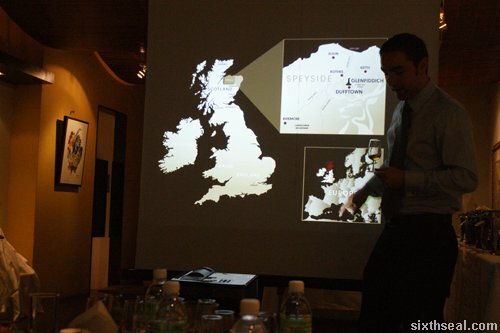 Each time before we taste the Glenfiddich, we were shown a video of what happened during the year the aged single malt was made. I can recognize scenes from 1997 (12 year old), 1994 (15 year old), and 1991 (18 year old). My memory started getting hazy during the 1988 (21 year old) video since I was only 7 then and I can’t relate to the 1979 (30 year old) video at all. I was still a good year away from swimming into my mother in 1979, accounting for the incubation period of 9 months so I don’t remember anything at all. 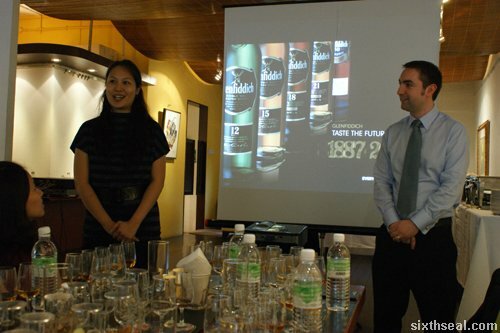 The Glenfiddich – Taste The Future session also had covered items on the table in front of us. The glasses contain items ranging from honey to figs. 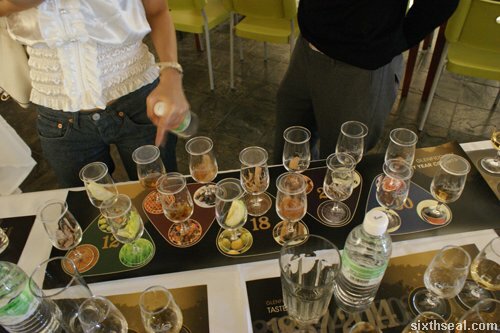 You’re supposed to compare the single malt with the items so there was a lot of sniffing and touching going on. Okay, that sounded wrong, but you catch my drift. Glenfiddich 12 year old has pear and subtle oak notes. Glenfiddich 15 year old has warm spice, honey and rich fruit notes. Glenfiddich 18 year old has oak, apple and cinnamon notes. Glenfiddich 21 year old has vanilla, rich toffee and new leather notes (!). 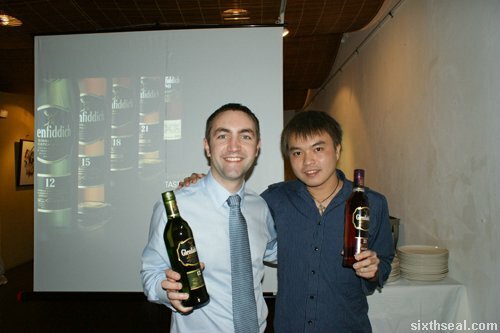 Glenfiddich 30 year old has sherry, fig and dark chocolate notes. 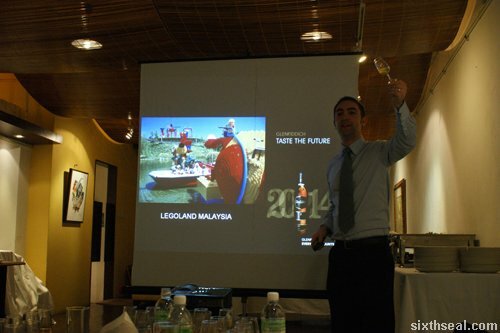 Mr Ludoviq Ducrocq told us to close our eyes and think back to what happened when a particular whisky was bottled. It should be noted that a Glenfiddich 15 year old (for example) could be much older than that – it just means that it’s aged for at least 15 years prior to bottling. I particularly liked the New Make Spirit. Weighing in at a staggering 70% alcohol, it’s Glenfiddich before it goes into the casks for aging. 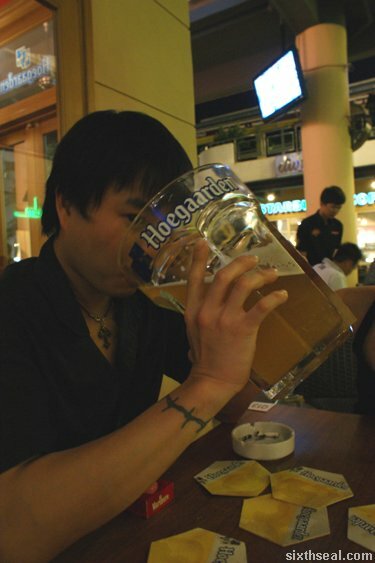 It has a really strong bite – reminds me of this 95% alcohol I had back in Melbourne. character and I can appreciate the aging process it went through. It’s as old as my sister and retails for RM 1,430. There is also a bottle of Glenfiddich Rare Collection 40 year old on display, which we unfortunately did not get a chance to taste. 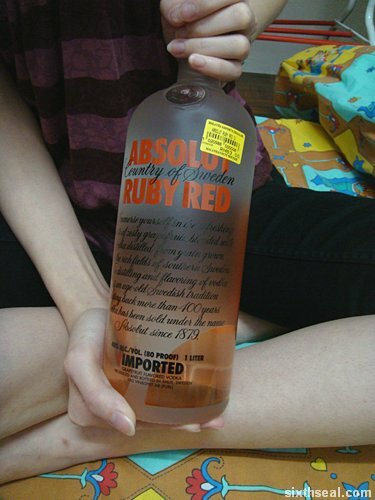 This bottle retails for an astounding RM 8,455. 2. 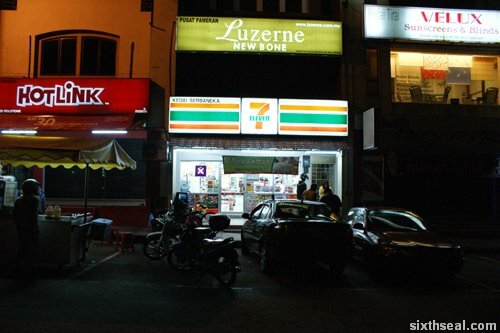 The friendly local neighborhood 7-Eleven night shift greets you with a cheery “Hello Boss!” and warns you that the leftmost chiller is out of action so your favorite beer is warm. No, not the Ayn Rand book…though you might find yourself starting to get as verbose as her after a couple of cans. I managed to find the best value beer in town just now. 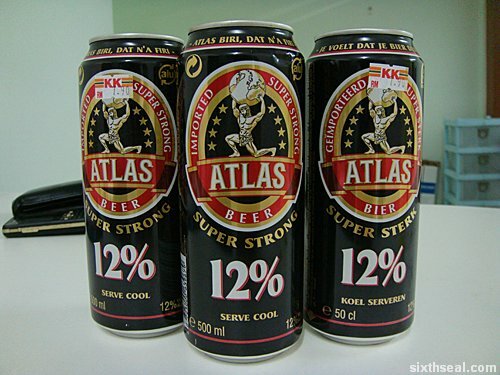 It’s Atlas Beer, weighing in at 12% – it beats SKOL for value. 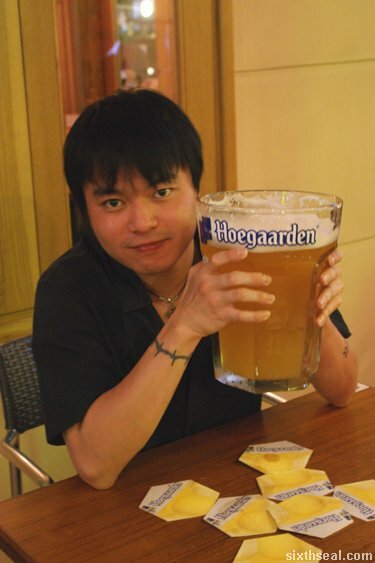 It comes in a 500 ml can – I love the feel of the substantial 500 ml cans. It just feels so solid! I have purchased a slab (24 cans) of SKOL and after calculations by my gf this one is just better. 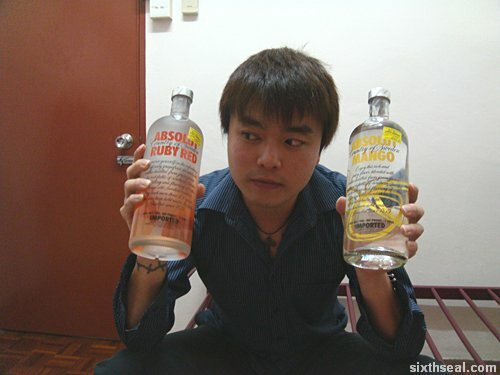 Every self-respecting alcoholic, I mean, ethanol consumer knows that the higher ABV the beverage is, the better. My current favorite. I’m going to be driving up to Cameron Highlands tomorrow at 6 am. 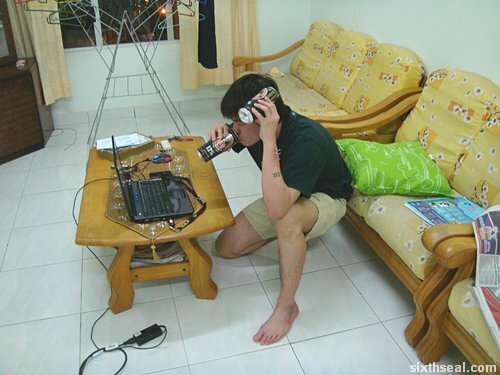 Be good, coz I won’t have net access there. It’s a birthday present for my girlfriend, and I anticipate prohibitive traffic congestion, but we’re going to do the suites anyway. 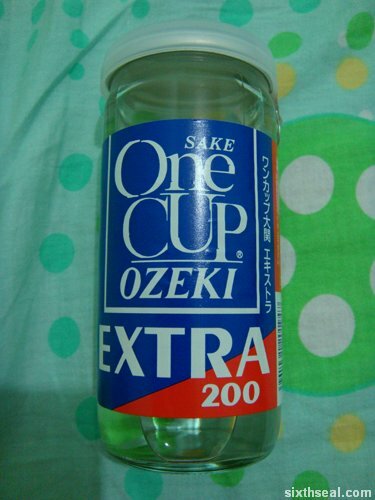 OZEKI One Cup Sake is a non-premium sake imported from Japan. It’s priced at RM 12.90 which is rather unusual for imported sake so I assume it must be a really cheap label in the Land of the Rising Sun. 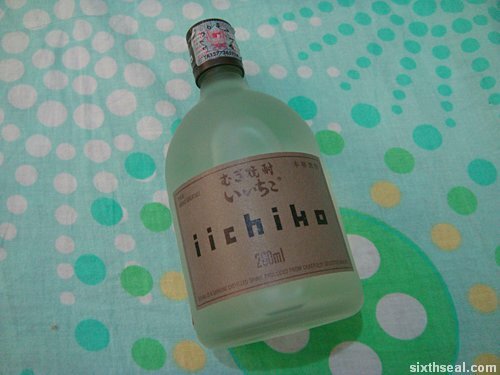 iichiko mugi shochu is a 100% barley shochu from Japan. Japanese shochu is usually made from either sweet potatoes, rice or barley and though it’s difficult to differentiate between the three, I tend to prefer barley fermented drinks. 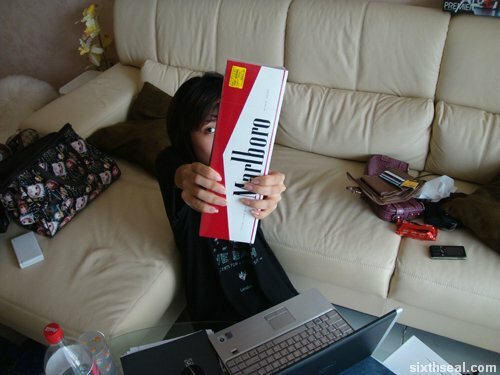 I dropped by Cheesie’s condo earlier this morning to pick up the carton of Marlboros that she had gotten for me duty free during her recent trip to Shanghai. 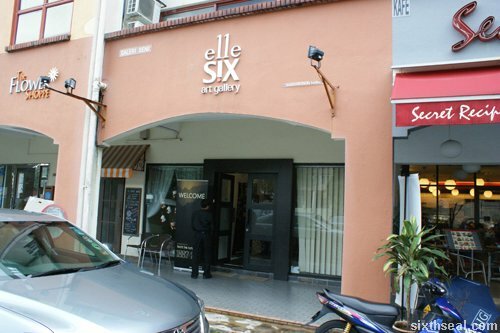 It’s the first time I’ve been to her place and it’s a really nice condominium unit with great security. I’m thinking of getting one myself once my paycheck stabilizes – it’s just about what you would pay for rent, except you get to own the property at the end. Kidding. I less than 3 you. Skol Super Beer is a new product line from Skol that lays claim to “The only 9% alcohol super strong beer”. The statement is not inaccurate – it is the King of Lagers (in a fiefdom of mostly 5% alcohol standard beers). Certain fortified beers like Carlsberg’s Special Brew attempt to challenge the sovereignty of Skol Super Beer, weighing in at a respectable 8.8% – close, but no cigar. The extra 0.2% alcohol in Skol Super Beer crowns it as the current king of all beers (measured by ethanol content). It is by far the highest alcohol content lager among all the other brands over here. I picked up a 3-pack at Jusco for just RM 12.80 (the special introductory price), which works out to about RM 4.20 per can. Skol is of Brazilian origin and considered a less premium brand than Carlsberg Special Brew, but it’s cheaper by a few dollars and has the potential to capture the middle income, non-discerning ethanol consumer market. The interesting trend with beer nowadays is the introduction of the 3-pack. The six-pack beer packaging is a very established tradition, and to go against that convention would be considered heretical by beer aficionados. However, I have noticed several advantages to the 3-pack retail mechanism – it’s at the right price point for the consumption habits of the majority of casual drinkers. Skol Super Beer – A very strong lager of the highest quality. 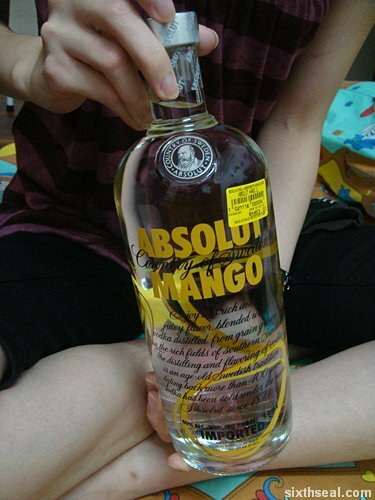 …and Absolut Mango, launched earlier this year for my collection.